The Valley Bulldog can either look like a taller version of an English Bulldog or a shorter version of a Boxer. Whatever the case may be, this type of dog has a muscular, sturdy build, a broad head, thick neck, and a very broad chest and shoulder area. The eyes are rounded and the snout is either really pushed in like the English Bulldog or sticks out a little more like the Boxer. The ears are a rose or button shape. The feet are thick and sturdy. It either has a short, little stump or a very small screw tail. 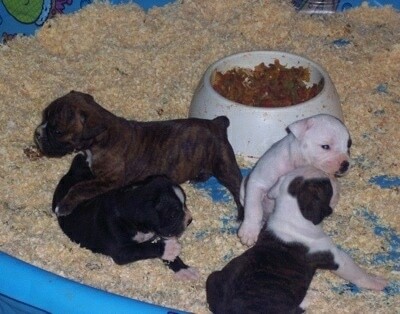 Colors include various brindles, white with brindle or any mixture of brindle, black, white, tan, fawn or red. Valley Bulldogs have very strong teeth and jaws and can either have a slight or extreme under-bite. The Valley Bulldog has an excellent temperament and when socialized properly, with an owner who understands how to be a pack leader, it can get along with all other breeds of dogs and humans (adults and children). It can be very calm and gentle and suddenly act really silly and playful. It loves to clown around and loves to be around its human owners. Valley Bulldogs are intelligent and can be taught many things quite easily. They make excellent watchdogs in the house and will bark at sounds that they don't recognize. They love to go for drives in the car! This is a very strong dog. Like all mastiff type breeds, the Valley Bulldog should have a dominant owner who can provide enough exercise. One who can give the dog the rules it must follow and the leadership it instinctually needs to stay balanced, in order to avoid any unwanted behaviors. 16 - 25 inches in length, 18 - 24 inch neck. A great deal of attention must be given to keeping the folds of the skin on the face very clean and dry, as well as the folds of skin in the tail area. These areas are highly prone to infection if they are not cleaned daily. They seem to have a tendency to get skin irritations and allergic reactions. An overweight Valley Bulldog can be a problem if its diet isn't monitored properly. Some Valley Bulldogs may have a problem breathing, depending upon how pushed in the snout is. They sometimes snore and can be rather flatulent at times. Drool is not usually a problem unless the dog is subjected to excessive heat or if it is waiting for a special treat. The Valley Bulldog doesn't need a whole lot of space inside the house because it is not a huge breed. It can do quite well in an apartment or condo. However, it is very active indoors at times. It will become quite wound up at times and go on a quick little rampage, running around the house like crazy. It doesn't matter what size your house is, it will still do it. The rampage will only last a few minutes, so just get out of the way and let your dog run. It's quite funny to watch. These dogs should not be left outside in the cold or excessive heat. They should sleep indoors. The Valley Bulldog needs daily exercise, which includes a brisk, long walk. They are very athletic dogs because they have Boxer in them; however, don't forget they have English Bulldog in them as well, so some can tend to be a little bit clumsy. They can run like a deer, however, when they need to slow down, it's not the most graceful thing. It's more like a tank that can go at high speeds. They love some good, safe chew toys of their own and a place to run free off the lead in a safe area. They are very strong chewers, so tough, durable toys are required. The soft, smooth coat has short fur that is easy to look after. The Valley Bulldog needs to be brushed or combed every once in a while, and perhaps wiped down with a wet cloth. They don't require baths very often unless they get really dirty. The folds of skin on the face, tail, belly and genital area (on the female) should be kept extremely clean and dry on a daily basis. Make sure all of these areas are completely dried after a walk in the rain or a bath, otherwise they will get infected. The Valley Bulldog is an average shedder. The Valley Bulldog is said to originate in the Annapolis Valley, Nova Scotia, Canada, giving it its name "Valley Bulldog." 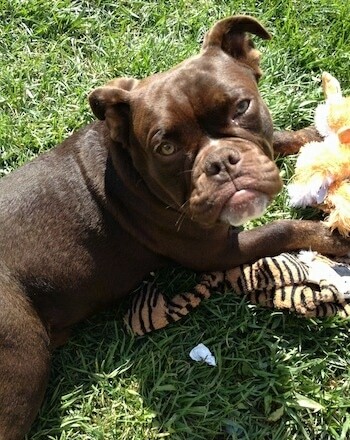 Its lines include the Boxer and the Olde English Bulldogge or English Bulldog and can be traced back to the mid-1900s. It is popular around the Nova Scotia, Canada, area. Some Valley Bulldog lines are breeding pure in both form and type, while other breeders are breeding simple Boxer-to-Bulldog crosses and calling them Valley Bulldogs. 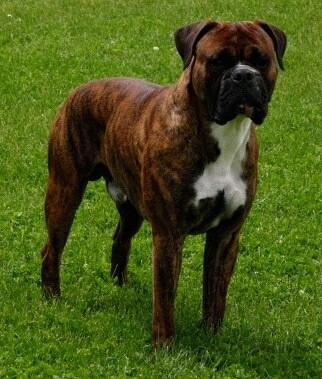 The ACHC and the DDKC, however, call the Boxer crossed with Bulldog a Bull-Boxer. 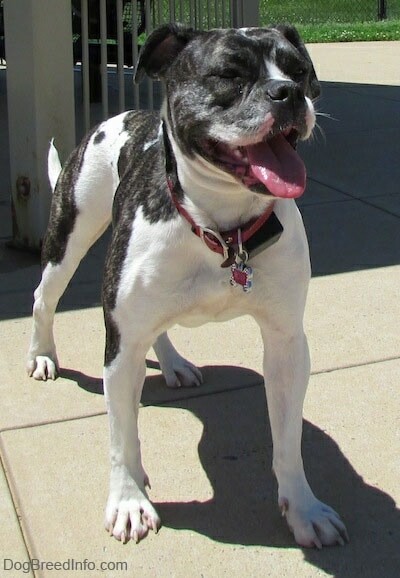 "Buck is a first generation (f1) Valley Bulldog (Bulldog / Boxer mix). He is about 24" at the withers and 80 lbs. and is 2 1/2 years old in this picture. He is the most loving and most well-behaved dog I have ever seen, but I am probably a little biased. He is also very intelligent, as he can sit, lie down, roll over, shake (with left or right by command), speak and stand up. If he hears you get snacks he will come do the whole routine. Buck is the epitome of a good dog." Winston is a proud 60-lb. 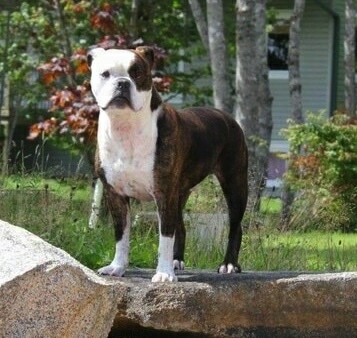 Valley Bulldog from Nova Scotia, Canada, shown here at 3 years old. Obi the Valley Bulldog at 11 months old—"Obi is my goofy little bud!! Always happy and loves other dogs and people, but he can be quite stubborn when he's tired." "This is Big Bubba. 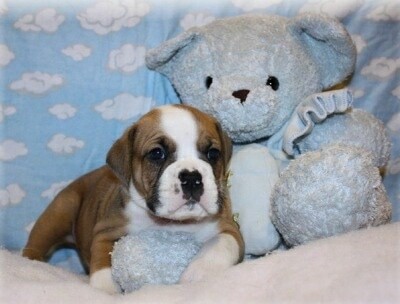 He is a 5-week-old Valley Bulldog puppy (English Bulldog / Boxer mix) that was born here. I have his mother, father and older sister. I shared this picture because I thought he is an adorable example of the hybrid. He is a little roly-poly and has a very mellow personality. I watch Cesar Millan quite often. I implement many of his training techniques with my own "pack" of dogs. I truly believe there is no such thing as a bad dog, just an ignorant owner. We have 12 dogs in our home and they are all important members of our family."